The ” Roar of Awakening” is the discovery that we are more than we think we are. It is the discovery that we have taken on identities that incorrectly or inadequately express our essential being. It is as though we awaken from a dream, look around, and become aware of a totally different reality. was developed in the 1970s by two American Jungian psychologists, Hal and Sidra Stone. The Stones developed their method on the conception that our personality is made up of many different and sometimes contradicting selves. These inner Selves have a life of their own with their own feelings, thoughts, opinions, values and body sensations. Some of these Selves are primary to us because we learned in early childhood, through our family of origin and our cultural background, who to be and who not to be . As a result the Selves who could adapt best then became, like an inner team, our personality or the so called Operating Ego. As long as we have no awareness about our primary selves, we might think this is who we are and therefore our life choices are determined by these Selves that run our lives unconscious and automatically. Especially in our western world common primaries are the ‘pusher’, ‘inner critic’, ’perfectionist’, ‘pleaser’, ‘caretaker’…. The operating ego is a combination of some of these Selves. Whatever this operating ego judges in others are parts that we disown, they hold the opposite of what our Primary Selves value and therefore are suppressed within us. These suppressed Disowned Selves don`t just disappear they live in the unconscious and influence our feelings, thinking and actions from there. With Voice Dialogue you get the chance to become more aware of your Primary Selves. 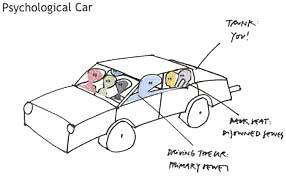 You learn to dis-identify from them and therefore to integrate and give space to the Selves you have suppressed. It means you will develop a more Aware Ego that can make more conscious choices instead of running on autopilot. You choose the destination and make the changes you want in your life. Noteworthy is that the aware ego isn`t just another self, it is more an Aware Ego Process that holds a balance between all these opposite selves and gives space to develop the parts of your personality you want more of to enrich your life. Voice dialogue is consequently a great tool to become more aware about the Selves in relationship called Bonding Patterns. 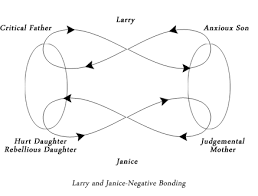 Bonding patterns are parent-child interactions between parts of two people in relationship which in most cases remain unconscious. Not the persons themselves interact but two parts of these people therefore it is difficult to de-tangle patterns an gain more choice and an aware ego also in relationship. With Voice Dialogue you get to know your automatic patterns gain more consciousness and start to build a more real and intimate relationship. You can use it on a regular basis to develop your aware ego process, but it also works as a single session for any situation that may need some light of consciousness.